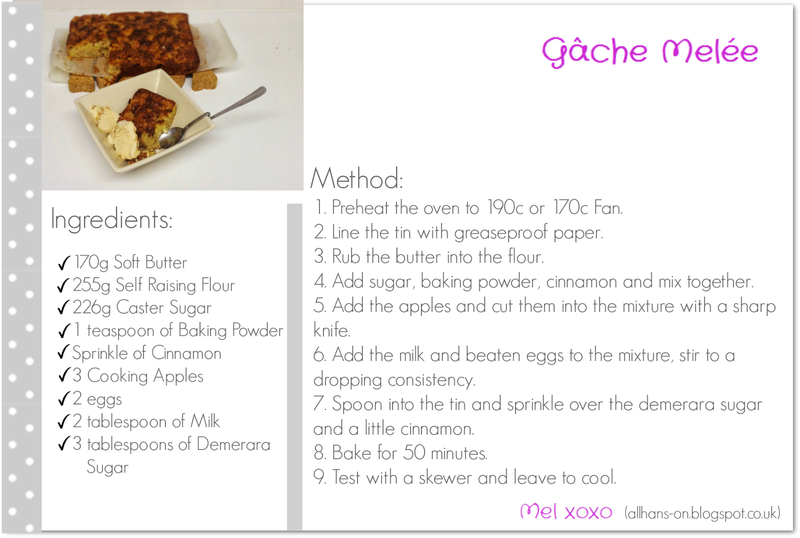 Gâche Melée, pronounced "Gosh Mel-Are" is a traditional Guernsey dish, commonly made with suet to make a heavy apple cake. 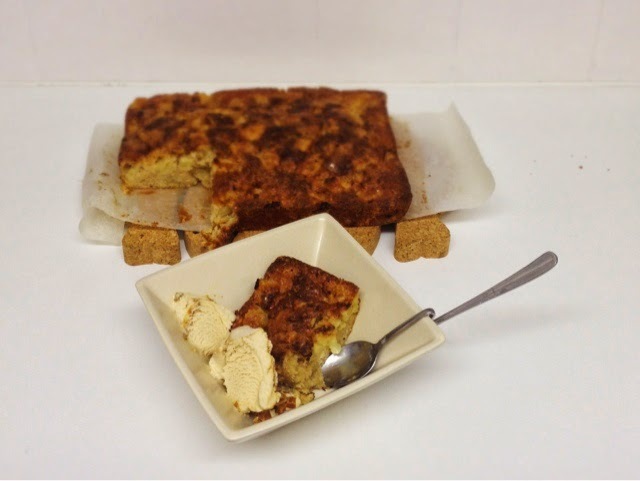 There are soo many variations of this recipe but this is my take and again its super simple. I like to be organised and set all my ingredients out onto the work surface first to ensure I have the right quantities and so I don't forget anything, but... this doesn't always happen! Then preheat the oven to 190c or 170c Fan. Now line you tin with greaseproof paper, here I used a rectangular tin, 27x20x5cm but any shape tin of a similar volume will do. 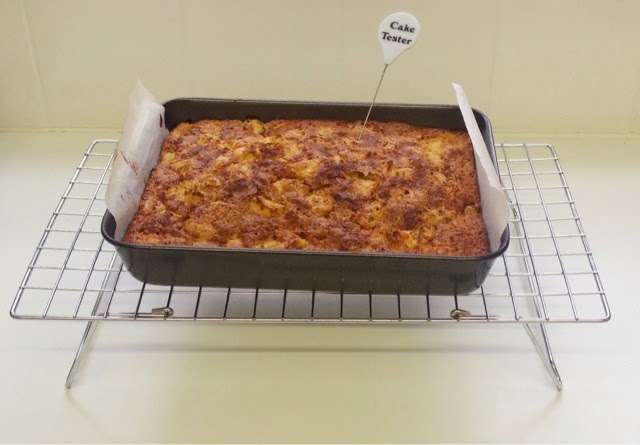 Or check out my Lemon Drizzle Loaf post to see were you can get mini loaf cases, great for portion control because if you are like me, one piece just isn't enough. 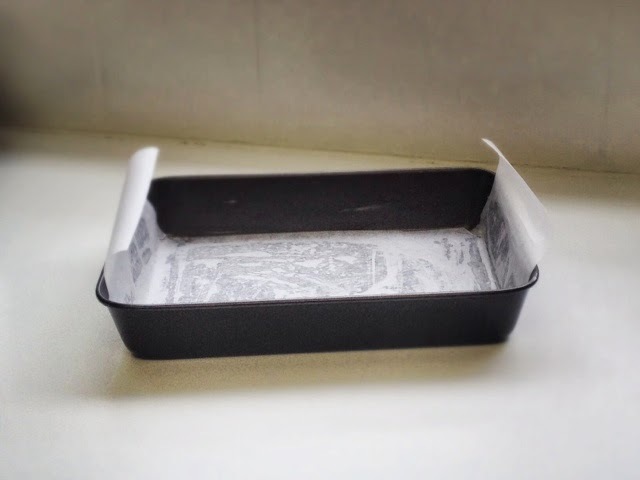 I have mentioned this in a previous post but my top tip is to always ensure that the greaseproof paper hangs over the edges so you can just pull on the two tabs, making it easier to remove from the tin once cooked. 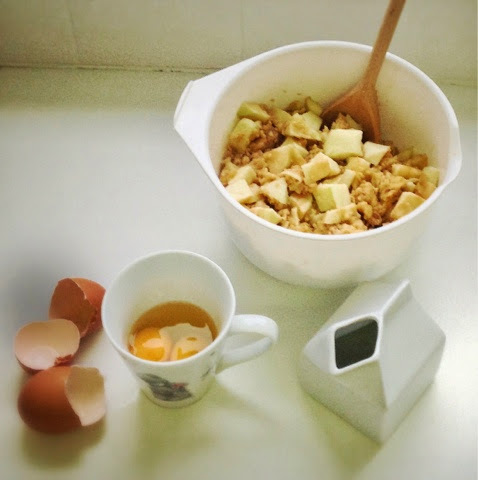 Now all the preparation is done - lets bake! This is the fun part, using your fingertips rub the butter into the flour until it resembles fine breadcrumbs. Oh and remember to take off any rings because there is nothing worse than coating your beautiful jewellery in butter and flour. 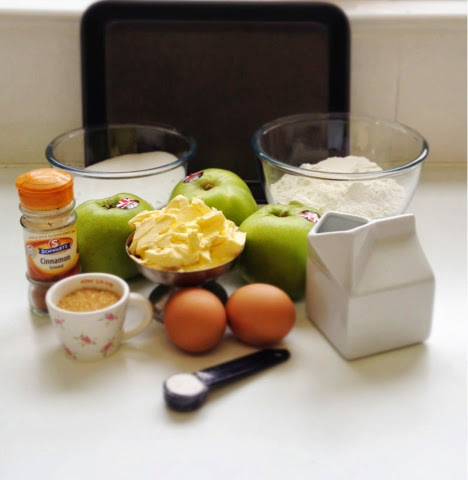 The sugar, baking powder & cinnamon can now be added. I tend to just make a guess with the cinnamon, then stir in all the ingredients. 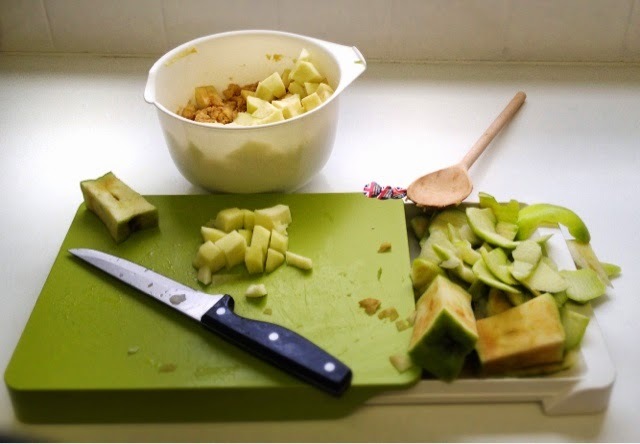 Once it is all combined add in those chopped apples and cut them into the mixture with a sharp knife to allow the juices to run and dissolve some of the sugar. Crack and beat the eggs, I like do this in a mug separately just for in case I drop any shell. Add the 'shell free' eggs and the milk to the mixture, I used 2 tablespoons of milk but its really just enough to bind all the mixture together until it is a dropping consistency. And that's the mix done. 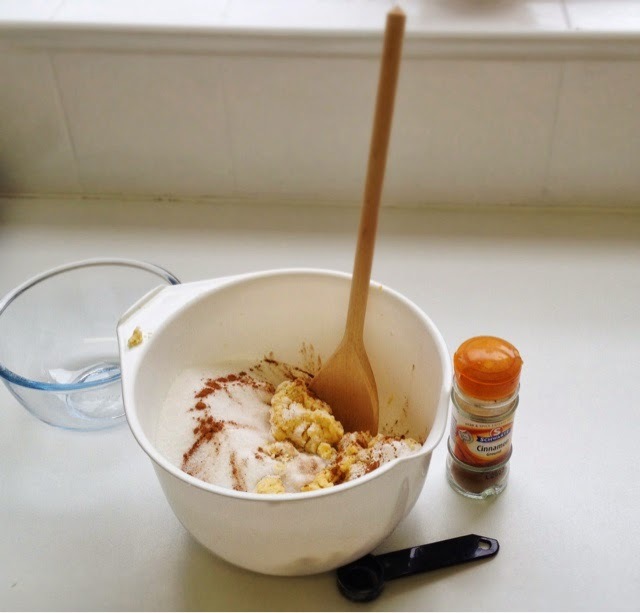 Spoon into the lined baking tin and use a flexible spatula to scrape every last drop from the bowl. These spatulas are great at ensuring you don't waste. 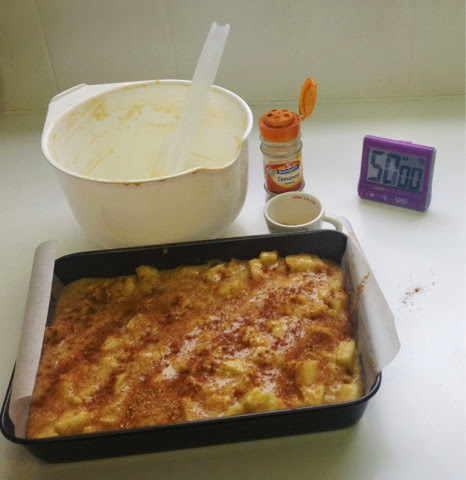 Sprinkle over the demerara sugar and go on, a little more cinnamon and bake for 50 minutes. Test with a skewer to ensue that it is cooked and leave on a rack to cool. It is great warm with Guernsey ice cream, cream or custard but can also be eaten cold. Unfortunately, I don't have any Guernsey Ice Cream but I do love me some caramel fudge ice cream it goes soo well with the apple - Mmmm Delicious. 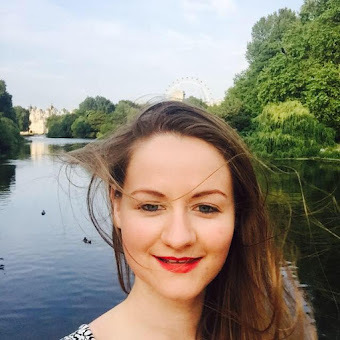 I hope you enjoyed this post, let me know your Gâche Melée variations or how you get on recreating mine.